Phoenix, Arizona: Southwest architecture, fiery Texmex cuisine, safe, clean and a balmy 75 degrees – what’s not to like! Frozen Canadians need no excuse to head south in February and Left Coast Crime offers a great way to connect with fellow crime writers, fans and readers. 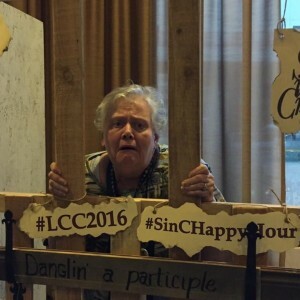 I kicked off LCC in the hotel bar at a party for members of the Short Mystery Fiction Society, generously hosted by noir writer, Craig Faustus Buck. 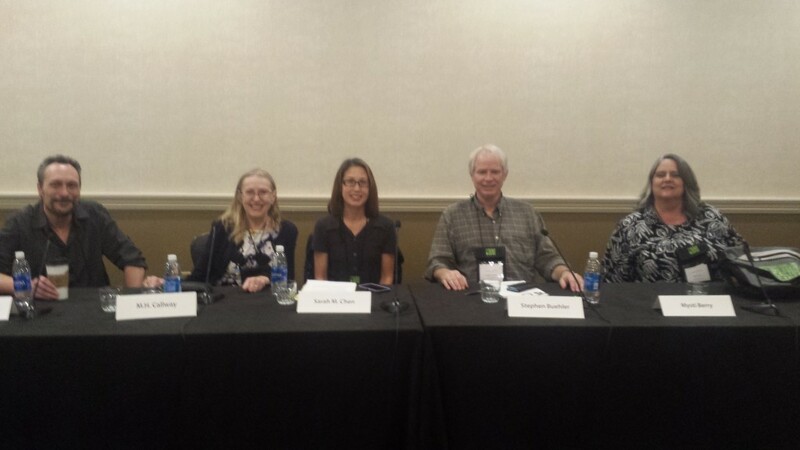 The stars aligned: I met the authors on my Thursday panel: secret Canadian and fab moderator, Sarah Chen; magician and short story author / innovator, Stephen Buehler; awesome screen writer, Mysti Berry; and her husband, talented graphic novelist, Dale Berry. 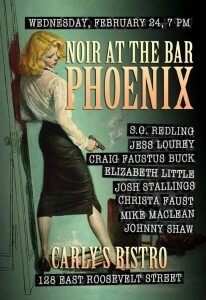 Sarah, Stephen and I walked over to Carly’s Bistro to attend Phoenix’s first Noir at the Bar. 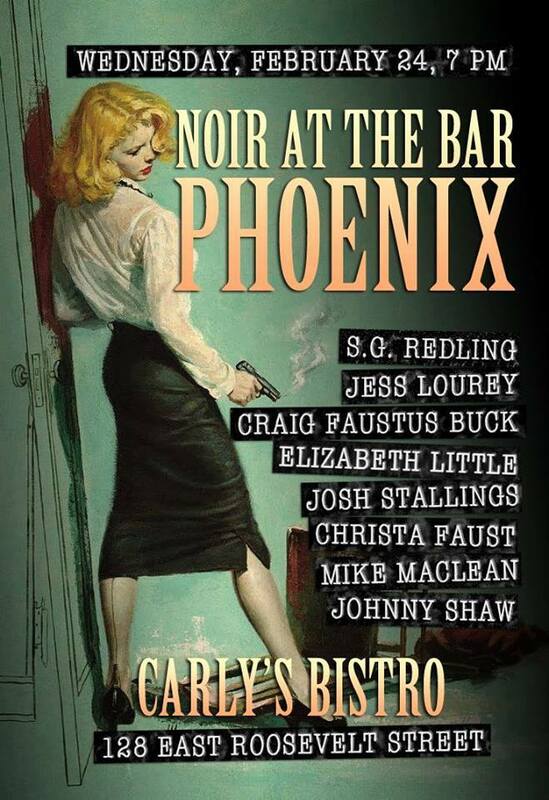 Delighted to share that Noir is thriving in the US southwest as well as in Portland and Seattle. Check out the terrific writers listed on the poster! LCC piloted a new way to get authors and readers together: Author Speed-dating launched on Thursday morning. Pairs of crime writers rotated through 18 tables of readers and we pitched our books at each table for 2 minutes. I had a terrific partner in L. C. Hayden, a critically acclaimed author who is published in a variety of genres. L.C. lives in El Paso, Texas. (Yes, the Texas city right across the border from Mexican murder capital, Juarez!) The infamous tunnels the drug cartels use are historical, built for smuggling during the 19th century. They are a key element in L.C.’s latest thriller, Secrets of the Tunnels, which I can’t wait to read. Thursday afternoon marked my debut as an author on an LCC panel. A Short Dance with Death turned out to be one of the most enjoyable panels I’ve ever been on. Beautifully moderated by Sarah, we drew laughs from the audience that filled the space – former Mayor Rob Ford was an easy target – then our discussion segued into the art of modern short story writing. Stories via Twitter: try writing a short story in 146 characters! Or 6 words. Even Alfred Hitchcock Mystery Magazine is getting with the times: it recently published Dale’s illustrated crime story – an historical first. Judging by the audience reaction, Dale’s story may be the first of a series. 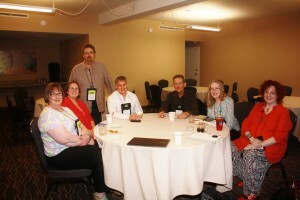 Several of my Canadian author friends attended LCC this year. 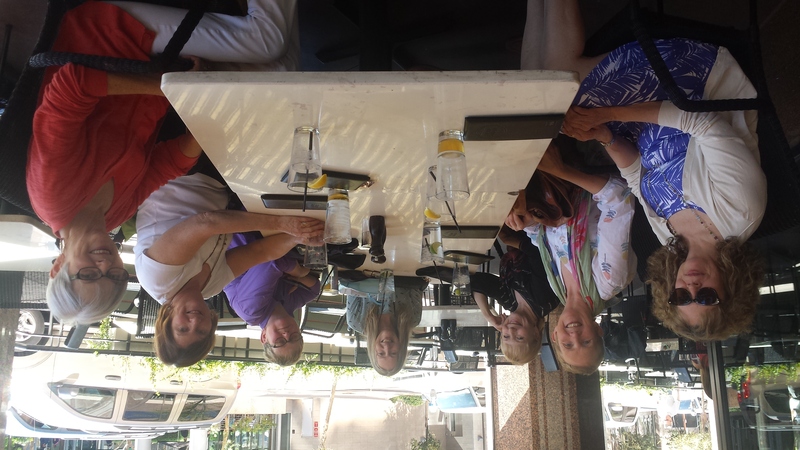 On Friday, we had lunch with Guest of Honour, Ann Cleeves. Ann is a delightful person who happens to be one of the world’s leading crime writers. She is the author of the popular Vera Stanhope series, though her Shetland / Inspector Jimmy Perez novels have my heart. Both have been adapted for television. 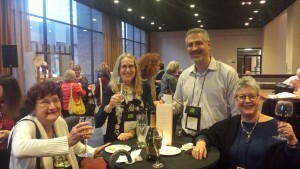 LCC also features Author-Reader connections where authors host short private events for fans. This way I met Tim Hallinan, author of the Simeon Grist and Junior Bender novels. Tim treated us to coffee, cookies and an hour to talk with him about writing: he has just written a book on how to finish a novel. It’s available in May and I am buying a copy! 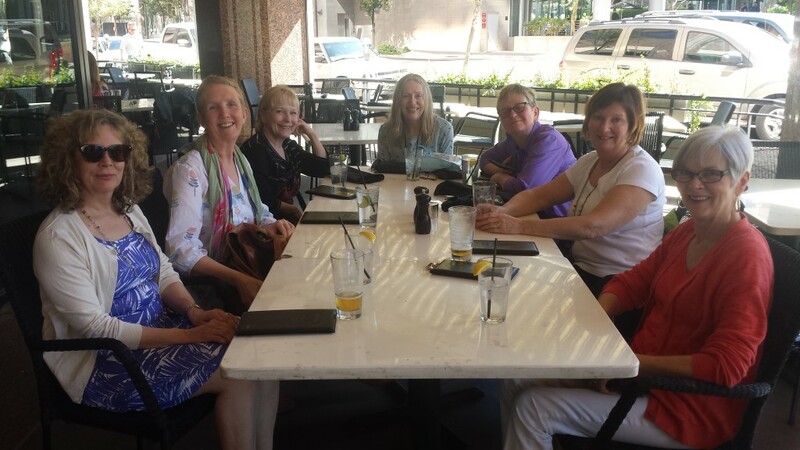 I also had lunch with 3 amazing women authors: Ellen Byron, who writes the Cajun Country series; Chris Goff , author of dark thrillers and bird watching mysteries; and Leslie Karst, who pens culinary cozies. 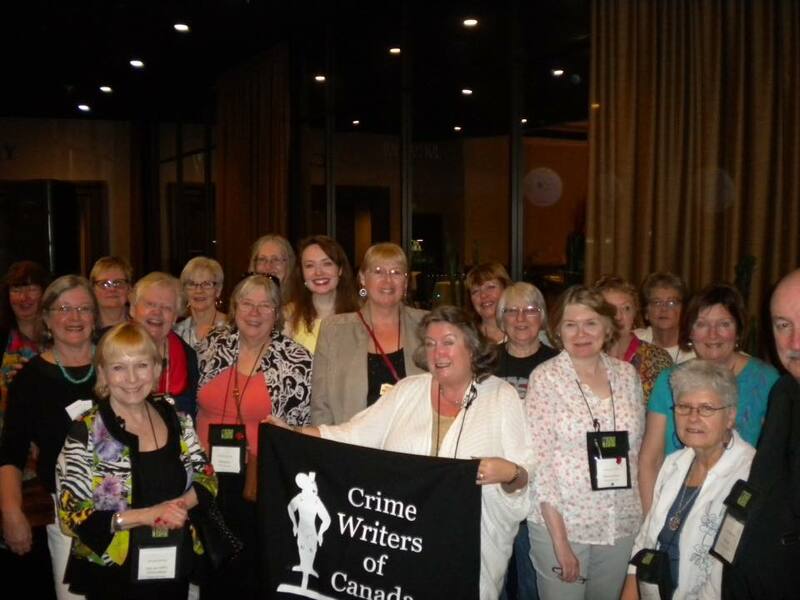 We bonded over the challenges faced by women crime writers, especially women thriller writers and we look forward to reconnecting at Bouchercon in New Orleans this fall. We Canadians also had our day. On Friday evening, the Crime Writers of Canada hosted “Meet the Canucks” to raise the profile of Canadian authors with our American friends. Authors were stationed at tables and fans circulated to get the answers to the quiz. A great way to chat with each writer. Prizes, of course, were Canadian books and maple syrup. The hotel chef even made poutine! By all accounts, a smash hit with everyone. We Canucks certainly know how to party both with each other and with American friends. Hugs and kisses to Jane Burfield and Miranda for being terrific breakfast companions and kudos to emerging writer, Laurie Sheehan, who has the best way of making new friends. Order a bottle of champers from the bar and walk around with two empty glasses – then fill one and give it to a new friend who need a lift! 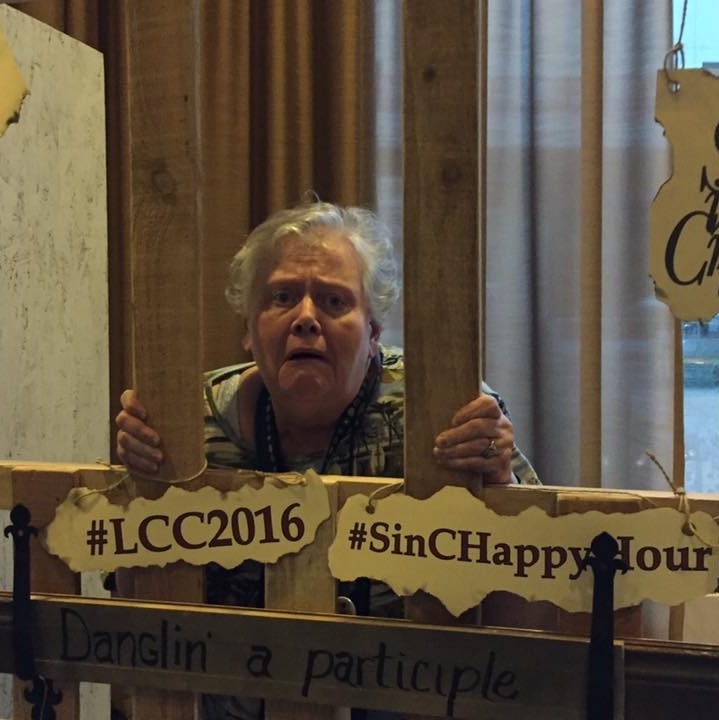 Jane being a good sport at the LCC reception. We did get her out for dinner later! 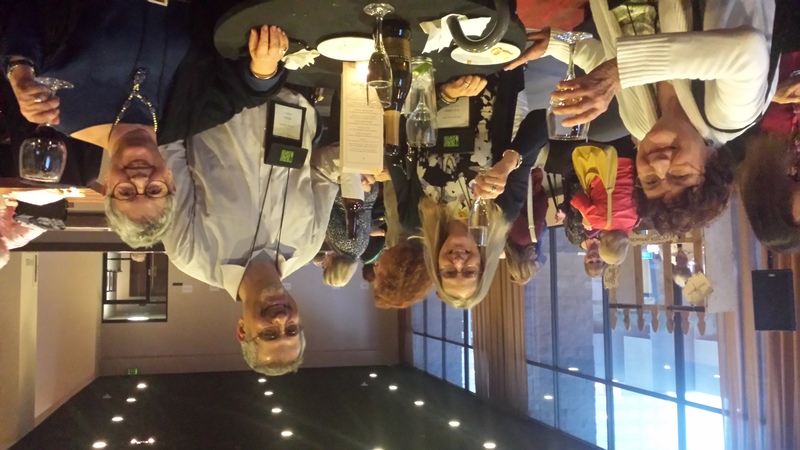 Also had great fun partying with Ellen Kirschman, police psychologist turned crime writer and Bill Syken, newly published sports mystery author. Banquets can be a little long on occasion, but LCC’s grand event was hosted by the wonderful Catriona McPherson who moved things along with deft humour while raising $10,000 to benefit a children’s literacy charity. 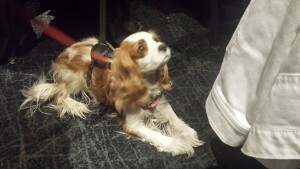 Great fun thanks to table companions Bill Syken and Gay Coburn, whose working dog, Koa, stole the evening. But true to form, a Surreal Trapdoor opened up. At LCC, banquet tables are hosted by authors who often present guests with small gifts. Our host, a rather serious lady, gave us a small handbook she’d written about Japanese toilets while touring the temples there. OK…Hope the book didn’t reflect what she secretly thought about her dinner companions! And hope she wasn’t offended that I left the book in my hotel room as a “Jokes for the John” for the next guest. Because I was booked on the red-eye back to Toronto, I had time for a tour of Arizona’s old west. More surreal trapdoors next week!